By having your students compete in the BJJ Tour Series you, as an owner/instructor, will also benefit by having the opportunity to win cash prizes! At each BJJ Tour event we rank the top schools based upon the number of students and number of wins in that specific tournament. The top school will win a prize of $1,800* for kids and adults. At the end of the year we will tally up the entire series and award the top schools for a chance to win an additional $1,000 for kids & $1,000 for adults! *Payment to be a combination of $1,000 in cash and $800 in Sambazon products. The US OPEN XXIII Brazilian Jiu-Jitsu Tournament will take place Saturday, October 26 and Sunday, October 27, 2019 at Santa Clara County Fairgrounds Pavilion Hall. All schools are welcome to compete. Competitors from all belt ranks in the Male, Female, Kids, Juvenile, Adult and Master Age Divisions may compete. This tournament is GI only. Medals and Certificates will be awarded for 1st, 2nd and 3rd places in each division. Every registered Competitor will receive a complimentary tournament t-shirt. All registered Kids Competitors will receive a medal. 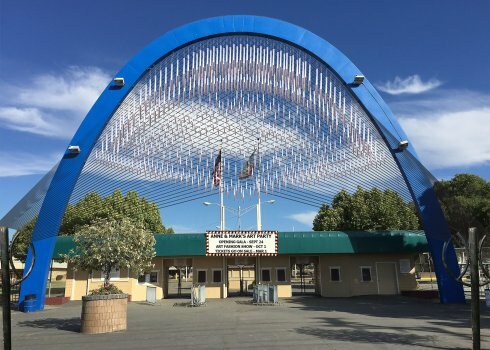 Competitors check-in at Santa Clara County Fairgrounds Pavilion Hall, the location of the US Open Brazilian Jiu-Jitsu Tournament on Saturday, October 26 from 7:45 AM – 4:30 PM. Or on Sunday, October 27 from 7:45 AM – 4:30 PM. If you have any questions regarding the U.S. Open feel free to send us an email. Register Now! NO REGISTRATION WILL BE ACCEPTED AFTER Monday, October 21, 2019 at 11:59 PM PST.